THE WRITING BUDDHA - Opinions | Books | Movies: It's Not About The Bike My Journey Back To Life by Lance Armstrong!!! It's Not About The Bike My Journey Back To Life by Lance Armstrong!!! The Chairman and Founder of the Lance Armstrong Foundation for Cancer Support and Research, Lance Armstrong is a world-renowned cyclist, seven times consecutive winner of the challenging Tour de France, and the most inspirational success story of a hard battle against cancer. Although his writing is brutally straightforward, the sheer honesty of his life’s account and the way he bares it all make his books gripping. The book is rich in medical detail. The account of his comeback, with the gruelling training sessions and arduous hard work, is truly intense and serves as the perfect guide for coaches and trainers. The charm of his writing lies in the sincerity that pours out from every page. Armstrong retired from cycling at the end of the 2005 Tour de France in the July of 2002, but returned to competitive cycling soon after, finishing third in 2009 Tour de France, and retired from competitive cycling as well in February 2011. He has three daughters with his first wife Kristen Richards. He also has five children with girlfriend Anna Hansen. As the title of the book states, this is not a work chronicling the victories and achievements of an ace biker. Lance Armstrong, a 24-year-old sportsperson, and the ‘Golden Boy’ of cycling was success’ favourite pick when he was titled as the top cyclist in the world, having consecutively won the esteemed Tour de France. However, Armstrong would soon come to realize that life, and not the track, was going to be his real challenge. In October 1996, Armstrong was diagnosed with stage-3 testicular cancer. The tumour soon spread to his lungs, abdomen, and brain. With only a mere 40 percent chance of survival, it seemed that his good life had come to an end. It took cancer to change Lance Armstrong completely. The blessings of a good family, supportive friends, and the quiet nobility of a fulfilled life came to mean much more to him and he found himself transforming for the better. After undergoing rigorous sessions of chemotherapy, he underwent surgery. Finally, he decided that he was ready to let his ruptured body and soul heal. Thus began the training session through the mountains of North Carolina, and as his love for the sport came back, he decided to make a comeback. With the greatest comeback story the world had ever witnessed, criticism and controversy were not far behind. After winning the Tour de France again, he was accused of consuming drugs to enhance his performance. 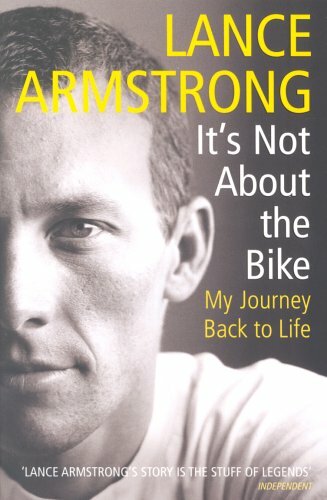 Inspirational and uplifting, It’s Not About The Bike: My Journey Back To Life traces the life of Armstrong as a sportsman, patient, father, and transformed man. Published on May 22, 2000, people all over the world have found tremendous inspiration from this book. Written in simple language that all readers will be able to understand and follow, it is enough to stir one’s life and perspective. This real life tale drives home the point that nothing is impossible and that a strong mind can surely conquer it all. Coming to my review, I was expecting a lot from this book but in all, I would say that it's average and nothing as exceptional as I kept hearing about it. Yuvraj's autobiography on his fight against Cancer is written in a better way than what Lance Armstrong has attempted some 10-15 years ago. He has gone into lots of description that killed the interest after a short moment of time. The first 100 pages and the last 100 pages of the book are exceptionally written, mainly because of the reason that it is about his take on how he chose cycling as a career and how he kept stepping ladders step by step and at last, became a World-class cyclist. In the last 100 pages, he tells about his struggle to participate and win Tour De France. Its really hard to imagine him struggling with a chemotherapy-suffered body on a bike to win a race that goes for three week on mountains where the rider has to climb up and down over it. Initially, the way Lance Armstrong has told about his mother's struggle for him shows that every success story has a hard-work hidden behind it. Then the frankness of Armstrong when he speaks about both of his father is also commendable. The way he initialized his cycling journey is descriptively written and its interesting to read. The book only gets boring in the latter half of his Cancer treatment. He starts describing things too much and goes too much in depth and narration. He should have kept them short to keep the interest alive. I felt like quitting the book then but I didn't as I wanted to read how he came back and won the World Championship title. Every time Lance Armstrong talks about his riding experiences, its cool but whenever he starts speaking about his Cancer treatment, the book turns boring. Unfortunately, I have to say this. I can't give the book much more than 3/5. I would recommend Yuvraj Singh's The Test of my Life than Lance Armstrong's It's not about the bike My Journey Back to Life.